What this Nigerian footwear brand would do with a $1m investment. 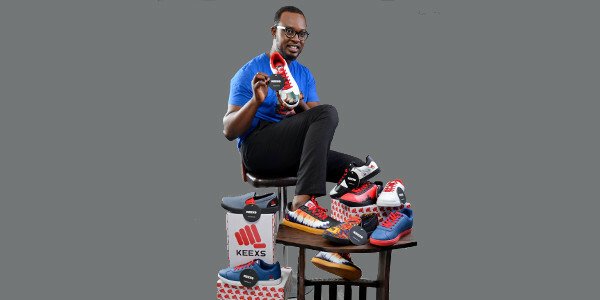 KEEXS is a Nigerian-based footwear brand that designs and produces unisex urban- and athleisure-type products. Its shoes are available at retail outlets, through e-tailers such as Jumia and Konga, and via its own online store. Babajide Ipaye, KEEXS co-founder, told us more about his company. 1. How did you finance your start-up? We started by financing our business in 2015 through crowdfunding on Kickstarter. And then in 2016, we were awarded grants after emerging the winner of a business plan competition (Sterling Bank Meet the Executives) and by becoming a beneficiary of the Tony Elumelu entrepreneurship foundation. We also raised some start-up capital from angel investors, and are now looking to raise a second round of funding for growth. 2. If you were given US$1m to invest in your company now, where would it go? If we had $1m we would improve our business operations, ramp up our distribution in Africa and other continents, and also complete the first stage of backward integration for manufacturing our sneakers in Nigeria. 3. What risks does your business face? Lack of ample and timely capital to scale rapidly and meet our consumer demands. And the operational environment in Nigeria. 4. So far, what has proven to be the most successful form of marketing? Being a business that has focused on using the limited resources available to us to achieve the farthest reach, we will say that digital marketing (leveraging social media as well as multiple online/digital PR channels) has proven to be the most successful form of marketing. 5. Describe your most exciting entrepreneurial moment. The success of our crowdfunding campaign was extremely exciting. The campaign saw our products pre-ordered from five continents (Africa, North America, South America, Asia and Europe). Following the success of this campaign, KEEXS has also been featured on numerous platforms such as Atlanta Black Star, Origin Africa (Madagascar), The African Fashion Week Nigeria, Heineken Lagos Fashion Week, Thomson Reuters, eNCA news, TV5Monde, Ebony Life TV, South African Fashion Week and CNN African Voices, just to mention a few. 6. Tell us about your biggest mistake, and what have you’ve learnt from it. In terms of mistakes we are not sure we have made any major ones yet, as we are going through a learning curve. But we try as much as possible to ride on the shoulders of giants by leveraging on the experience of professionals, strategic partners as well as our board of directors. by Justin Probyn for How we made it in Africa.